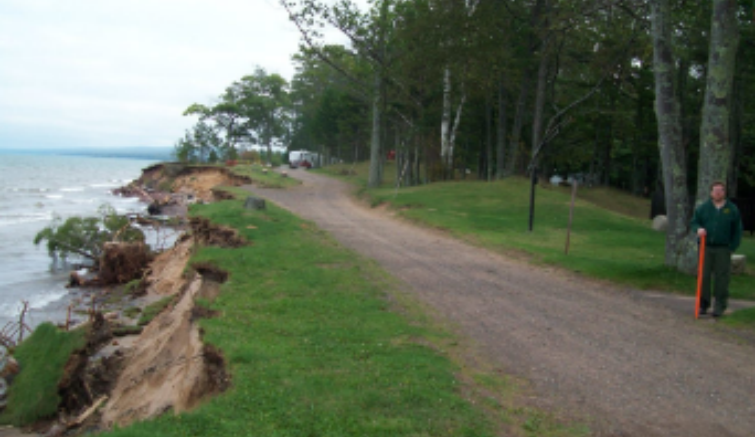 HANCOCK — While erosion continues to eat away at the campground at McLain State Park, the Michigan Department of Natural Resources is planning to make several changes. Work was slated to being this spring, but the project had to be put off until after Labor Day. Phase one of the project includes a new shower and restroom facility, plus 20 new campsites near the front of the campground that will be completed sometime next year. Later on, the park plans to expand the day area at the West Portage Entry, known as Breakers, to make up for space that will be lost near the park entrance. This season, campers are only being charged the “semi-modern” rate for campsites and mini-cabins, even though the facilities are fully operational. With $3 million in upgrades, park officials say the temporary inconvenience will be worth it.